Date of earliest burial is not known: oldest headstone, 1853. Site (7 A.) was deeded to the city in 1870 as an existent graveyard. 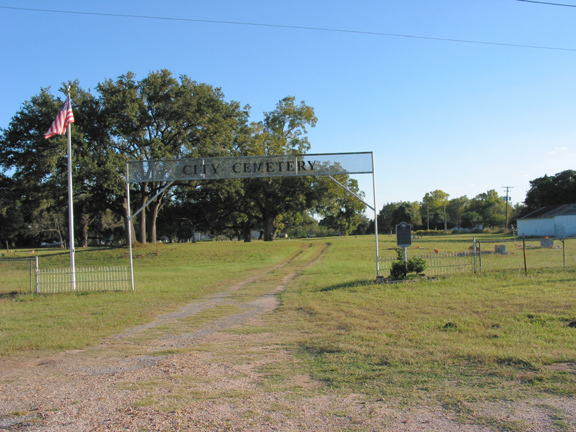 Burials here included Benjamin Beason, one of Austin's "Old 300" colonists: W. B. DeWees, also in "Old 300," founder of Columbus; 1830s historian Dilue Rose and husband, Sheriff Ira Harris; Gen. Augustus Jones, War of 1812 and Texas War for Independence veteran; Dr. John G. Logue, known as founder of the first drugstore in Texas, 1845; The Rev. Jacob Scherer, founder, in 1857, of Colorado College; many Confederate soldiers; and victims of 1873 yellow fever epidemic.